The sequel to Badge on My Collar -- A Chronicle of Courageous Canines has been released. The first book made Amazon's Top 100 Best-Selling Animal Books in 2007. Badge On My Collar II - To Serve With Honor proudly succeeds the book used by the Royal Canadian Mounted Police as a prize in its Name the Puppy Contest and is used by the U.S. Police Canine Association to raise funds. I found it fascinating to go with dogs from the Scottish Highlands to the rugged Australian land down under. 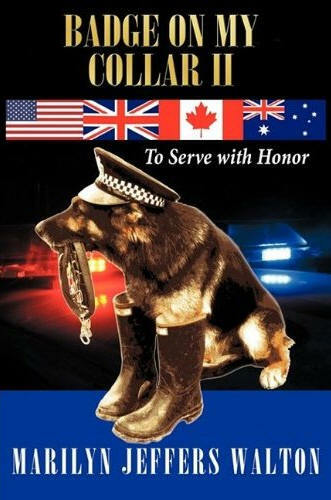 Marilyn Jeffers Walton takes you around the globe to ride along with dogs whose stellar careers and unselfish sacrifices exemplify the brave character and profile of today’s police canine. Tracking through the Arctic blasts of Canadian winter or across the scorching desert heat of Arizona, they go where they are called. You will be taken through the dangerous jungles of Vietnam and share patrolling through the magical green of England’s Sherwood Forest. You go inside the U.S. Capitol Building and hover in a helicopters over Indonesia with four-footed officers who protect and serve and you'll love the hilarious tales of New Jersey’s Tracker. Whether accompanying a crack SWAT unit or tenderly standing by the hospital bed of a sick child, these multi-faceted dogs will warm your heart. The common thread so beautifully shared with readers is the dogs' love for their handlers, their bravery in the face of confrontation with the “bad guys” and their total willingness to surrender their lives in order to protect - and to serve with honor. Order Your Copy of Badge On My Collar II on Amazon Today! "Makes a GREAT Gift."